Our long trade in AUD/USD didn’t get a chance to execute as the lowest the pair got since the trade idea was about .9405. With the pair back at the top of the channel (near .9490), I have decided to close all open orders and wait for the next trade opportunity. Close orders on AUD/USD. No trade. Good evening! 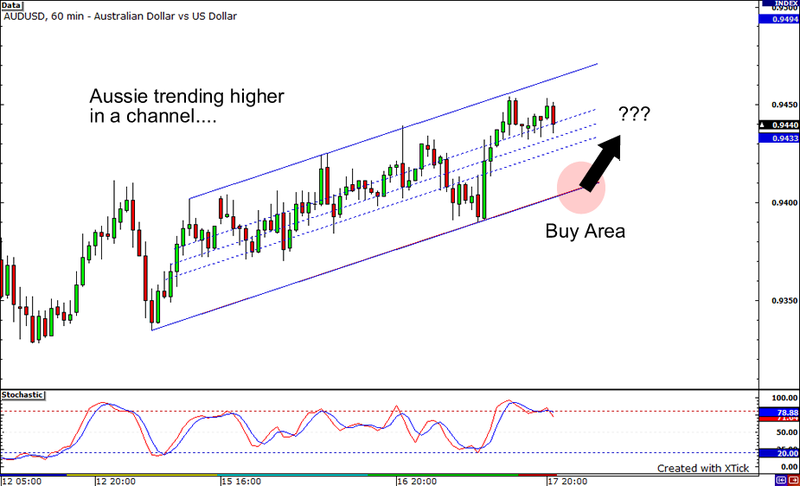 Looks like a channel is forming as the Aussie trends higher against the Greenback. Will the Aussie continue to rise? Fundamentally, the US Dollar has found renewed interest recently as traders priced in a possible rate hike, but with recent US economic data coming in weaker (housing and industrial production) a rate hike will have to be pushed back until later in the year. Things aren’t looking so good for Australia as well as consumer sentiment wanes, but the Aussie does have the interest rate differential advantage and its correlation to commodities. The environment is uncertain for both currencies, but I think the Aussie will be favored over the US Dollar for now. Technically, we are keeping it simple by playing the channel. If the pair drops to the bottom of the channel, I look to go long. No major evernt risk for the next 24 hours, so technicals should play out for now, but stay tuned for updates and adjustments. Good luck!